Used to be, I devoted every one of my September columns to books that appeared on the American Library Association’s Most Frequently Challenged annual list (sometimes called the “banned books” list). I haven’t done that for several years for a couple of reasons. For one thing, it was often hard to find time to read, reflect upon and write about several books in just one month. For another, the same titles kept cropping up year after year, so sometimes there weren’t enough books on the list that I hadn’t already read and written about. Lately, I’ve been choosing just one book to feature during Banned Book Week, which officially ended yesterday. I asked Putnam County Library Director Stacie Netherton if she had a recommendation. Stacie went on to tell me that, in the spring of 2015, a patron challenged the book as inappropriate and filled out paperwork requesting that it be removed from the library. Under the direction of Clay Robertson, the library director at the time, “I Am Jazz” was reviewed by a committee of professional librarians and deemed appropriate for the collection. The patron had a right to appeal that decision to the Putnam County Library Board, but he or she chose not to. The transgender issue is something I’ve been trying to understand ever since that unforgettable episode of “Medical Center” in 1975 where Robert Reed changed from a man to a woman. Years later, I read with fascination Jeffrey Eugenides’s extraordinarily complex novel “Middlesex,” which won the Pulitzer Prize in 2002. It examines the life of a character born with a hermaphroditic condition that makes the child appear female but have the brain and hormones of a male. I was intrigued when Sonny and Cher’s daughter Chastity became son Chaz. And I continue to watch the uproar over Bruce/Caitlyn Jenner. “I Am Jazz” is nowhere near as sensational as any of those examples. It deals with gender dysphoria in a simple and gentle way. But the book doesn’t ignore or gloss over the complications Jazz encounters when faced with which bathroom to use, whether she should play on the girls soccer team or the boys, or the fact that some of her schoolmates tease or ignore her. This little book just may be the perfect first step in helping both children and adults understand what it means to be transgender. Or it may not. 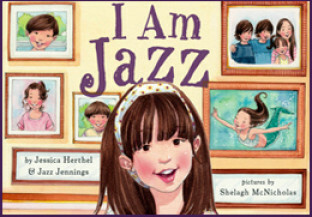 Parents who prefer that their children not be exposed to the subject matter in “I Am Jazz” must be free to keep it out of their hands. But they must not be permitted to insist that no one else’s children read it. We don’t all think alike, thank goodness. That’s why controversial material must be allowed to remain in our public schools and libraries. And why those who champion the freedom to read celebrate Banned Books Week this time every year.